Kristen Fischer is the author of Ramen Noodles, Rent and Resumes and an award-winning writer and editor living at the Jersey Shore. She graduated from The Richard Stockton College of New Jersey in 2000 and soon after realized she wanted to pursue writing instead of her degree in environmental studies. Read Kristen's blog at http://www.ramenrentresumes.com. Visit Kristen Fischer in the Expert Advice section to get your questions answered. For recent college graduates, it’s hard to find a job that you love, decide if you can live on your own, manage your finances, and maintain relationships. But this often dubbed “quarterlife crisis” does not have to be a catastrophe! In fact, it can be quite useful—even essential—to success! In Ramen Noodles, Rent and Resumes: An After-College Guide to Life, author Kristen Fischer encourages grads to embrace—instead of dread—life after school. She introduces the concept of “The After-College,” in which graduates learn to thrive during their 20s. 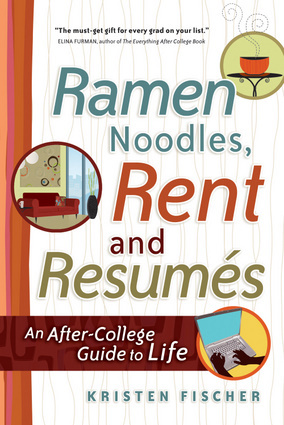 Highlighting dozens of real-life graduates who have navigated their way through this challenging but exciting phase of life, Ramen Noodles, Rent and Resumes is packed with valuable strategies for career advancement and personal growth.